A powerful immunostimulant with clinically proven properties. SuperSmart's beta-(1.3/1.6)-glucan contains Wellmune WGP®, a natural substance found in the cell walls of a baker's yeast (Saccaromyces cerevisiae), which is obtained using an exclusive proprietary process giving an exceptionally pure product. Different types of glucan can be isolated from almost all forms of yeast. SuperSmart's beta-(1.3/1.6)-glucan (containing at least 75% beta-(1.3/1.6)-glucan) is the most widely-studied most biologically effective. Clinical studies have shown that beta-(1.3/1.6)-glucan boosts immune response by activating key cells in the immune system, including macrophages and neutrophils, enabling them to act more quickly in recognising and destroying harmful foreign cells. Research in human and animal cell cultures suggests it can stimulate various aspects of immune function, such as phagocytosis or interleukin production. The first studies showing beta-glucan's effect on the immune system were conducted in the 1940s. By the end of the Eighties, its precise mode of action had been established: it activates specific receptors located on the surface of macrophages, releasing a cascade of events which produce an entire arsenal of immune defence weapons. The first human study involved cases of advanced HIV infection. Administration of beta-(1.3/1.6)-glucan resulted in an increase in serum IL-1 and IL-2 cytokines and interferon, even in subjects with severe immune deficiency. - to severely stressed subjects, over four weeks, led to a clear improvement in their general health. It increased their energy by 42%, reduced fatigue by 38%, and tension by 19%. - to marathon runners, boosted their immune system to the extent that they had 66% fewer respiratory system infections. These findings highlight beta-(1.3/1.6)-glucan's ability to counteract immunodepression caused by intensive exercise. Wellmune WGP® is a registered trademark of Biothera. Take one vegetarian capsule a day 30 minutes before a meal, or as advised by your therapist. 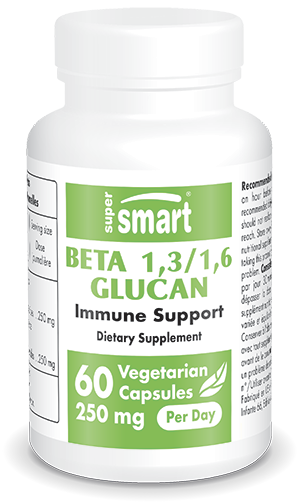 As it takes around 5 days for beta 1.3/1.6 glucan to have an effect on the immune system, daily supplementation is recommended.